When crafting high-fashion footwear, designers face numerous challenges. People want something that’s elegant, unique, and striking. Exotic skins can provide these things—but not all exotic skins are ideal for all footwear projects. Useable Area. You need a skin that’s just the right size for making shoes, but not too large, or else you’ll end up with a lot of waste. Durability. The skin you use should be able to take a fair amount of wear and tear. Scuff/scratch resistance is a must. Flexibility. As tough as the skin needs to be, it also should be able to flex and bend without creasing. Crease marks can ruin the beauty of a carefully crafted piece of footwear. Smoothness. In most high-fashion men’s shoes, you’ll want a smooth surface to get an elegant look. It can be especially important to avoid scale flippage (like in python skin). Smallness of Scales. For scaled hides, it can be a good idea to use hides with smaller scales. Smaller scales usually track better with the small size of a shoe and can be easier to work with. So, which hides best meet all of these criteria? 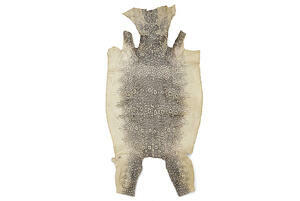 Alligator skin has nearly unparalleled flexibility and softness among crocodilian hides. This skin is highly sought after for a number of uses, including shoes. While both the back and belly skin of an alligator is great for boots, the sleeker look of a dress shoe generally works better with the belly skin of the gator. When choosing a skin for men’s shoes, it’s best to pick a grade 2 or 3 alligator belly hide that’s about 30/36 cm to get the best combination of quality and price. If buying grade 3 hides, be sure to check if the defects in the hide are able to be worked around—you don’t want a hole right over the toe of the shoe. It’s best to order alligator skins in pairs whenever possible. This way, you can make a pair of shoes from matching bellies, and use the tails to make a different pair of shoes/boots. Alternatively, if you don’t want to make shoes from the tail of the alligator skin, consider using the tail for making a matching belt to pair with the shoes. 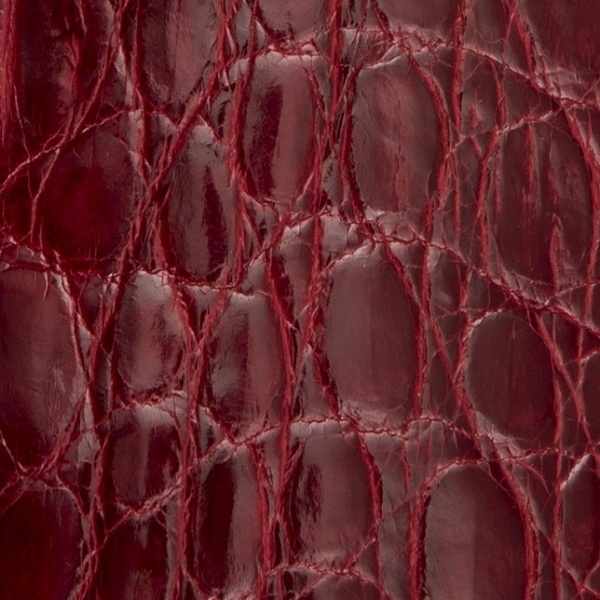 Crocodile flanks are a popular second choice to alligator skin and are considerably more affordable. When purchasing flanks, you’ll probably want to pick them up in pairs of 1.5+ square foot hides for each pair of shoes. To ensure that you can properly contour the shoes, you’ll want to make sure you get one right flank and one left flank for each pair of shoes. Getting flanks is a good idea when you want a consistent scale shape—the flank scales tend to be uniformly round in shape. Full skins, by comparison, will have very different scale shapes from one part to the next. Shell cordovan leather is nearly perfect for making high-end men’s shoes. Not only does it possess a tight grain and inherent sheen—it is naturally scratch and scuff resistant. Plus, at 2.5 square feet, the average piece of shell cordovan skin is nearly the perfect size for a pair. If the surface of shell cordovan leather is marred, most scratches and scuffs can be easily removed with a special leather conditioner. All in all, shell cordovan is a top-quality leather for making elegant and functional men’s shoes. Rather than just buying the flanks of a caiman crocodile, some shoemakers buy the whole caiman hide. 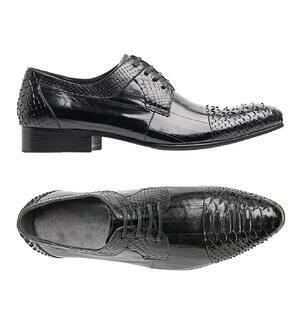 Typically, caiman skin for shoes uses the belly cut, which is softer and less rigid than the back. As with the flanks mentioned earlier, caiman skin is a much more affordable option than alligator. The average size of a caiman skin used for shoemaking is about 33-38 cm in size. Just like alligator skin, you’ll want to order caiman skin in pairs so that you can use matching belly scales for one pair of shoes, and matching tails for another pair. While not as well-known as some of the other hides on this list, lizard skin is still an excellent material for making men’s shoes. One of the biggest advantages of lizard skin is that the scales in the hide tend to be very small and regular in size compared to alligator or crocodile skin. This lends itself to a more conservative look for the shoe compared to the larger, more obvious scales of the crocodilian hides. Another major advantage is that of all the exotic skin options in this post, lizard skin is by far the most affordable. This makes lizard skin great for the shoemaker who wants to create an elegant and unique piece but has to do so on a budget. As with most other reptilian hides, you’ll want to order lizard skins in pairs—two 30+ cm skins per pair of shoes you plan to make. These are, of course, just a few of the best options for making formal men’s shoes from exotic leather. There are a number of different exotic hides you could use for footwear that are quite a bit different from the hides mentioned in this post. Need help picking out the perfect type of exotic skin to use for your next high-fashion footwear project? Contact Pan American Leathers today for advice, or check out our exotic leather guides!